Once upon a time, famed sci-fi director James Cameron made a little film known as Titanic. Made with a record $200 million, the picture earned a record $1.8 billion at the worldwide box office, won a record 11 Oscars (Ben-Hur and Return of the King are the only other two films to do this) and ignited the Leonardo DiCaprio and Kate Winslet to become the most sought after talent today. That was over a decade ago. Now Cameron is back with another next big budget saga, to once again defend his self-claimed title as “King of the World.” Mission accomplished. The film has already broken most of Titanic’s records, earning a staggering $2.4 billion worldwide. And with critical praise, nine Oscar nominations, and his 3D technology reshaping the industry, it looks like Cameron may need an avatar of his own just to share his great success. But records, innovations and box office aside, how does good is Avatar? Set in year 2154, the paraplegic Marine Jake Sully takes the place of his late brother on a mission to distant moon Pandora. 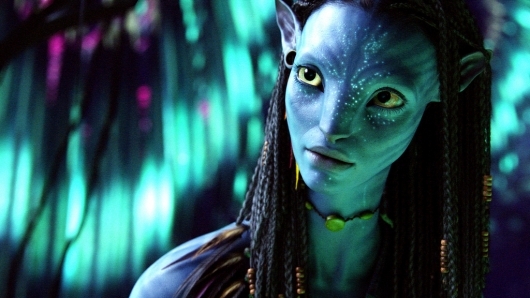 His task: to observe the native Na’vi culture in a 10 foot blue tailed avatar which resembles the natives. When the evil corporation in charge of mining a resource called unobtanium offers Sully a spinal correction surgery in exchange for information, Sully begins double crossing to help the military blueprint the destruction of the natives home. But when he begins fall in love with the beautiful blue princess Netytiri, Jake is placed in the middle of nothing less than a war of two worlds. Pickingup on Cameron’s obvious critiques of cultural preservation, environmentalism and imperialism in the Middle East isn’t difficult. And Cameron himself has no problem admitting that the film is a message movie, despite how much it has angered right wing critics. “It’s ‘Death Wish’ for environmentalists. When did nature ever get to fight back in a movie?” Cameron asks. Yes, parallels to the war in Iraq stick out like the visually stunning 3D avatars themselves making Avatar feel like the perfect pick of the last Best Picture of a decade tattooed by Bush’s failure to deal with environmental protection, terrorism, natural disaster, immigration and white anxiety. Those with a strong concern for the environment will feel guilted, but then ultimately satisfied when the ending relieves the main character and the audience of any of true call to action with its feel good, white man saves the world ending. Avatar’s pro-environmentalism doesn’t stop there, with its over obvious recycled storyline which echoes conventional Hollywood modes of depicting imperialism. See Dances with Wolves, Pocahontas and The Emerald Forest for further proof. The movie is unique, however, that Manifest Destiny fails, thanks in part to not the efforts of the helpless natives, but the concerned and strong willed white man. While storyline is conventional, it is enjoyable. The dialogue is a different story. Cameron is a master storyteller in this sense, he plucks and pens stereotyped Hollywood characters any audience members around the world can understand and enjoy, which makes it no wonder the film is such a hit. To more sophisticated audiences, his choices are flat and laughable, but saved by the casting of his lead actors Sam Worthington, Sigourney Weaver and Zoe Saldana who do wonders with the motion caputre technology. Much of the movie is reminiscent of Titanic, with a poor score that sounds oddly familiar to a popular Céline Dion song and big glizty action for everybody to enjoy. Where the movie does succeed, which is little secret, is through its groundbreaking 3D and performance capture technology which is shaking up the entire industry. By developing his own $12 million camera, Cameron was able to create one of the most cinematic and magical worlds ever seen on the silver screen. It is amazing that Cameron, known for his micromanaging, was able to direct a team of 3,000 which included Peter Jackson’s WETA Workshop and an army of designers and editors that created one of the best tecnical film in years. The film is titanic in everywhere, from its crew, budget, ambitions and attention to detail. Unfortunately Cameron aims to make a crowd pleaser, dumbing down the dialogue, character depth and dynamics of the film. The beauty of Avatar is that it can be whatever movie you want it to be. It is tender love story, a gripping actioner, a mind blowing sci-fi epic, a political message movie on 21st century America, or a visually magnificent creation like we’ve never seen before. Whatever Avatar is to those watching, despite its flaws, it is still a benchmark in filmmaking, a great exploration of the next frontier. This entry was posted in Best Picture Nominee, Reviews and tagged 3D, Avatar, Best Picture, James Cameron, Motion Capture, Titanic by LukeMiller. Bookmark the permalink.